I love Spring! I love seeing new flowers, green grass, hearing birds outside my window, and being able to play at the park again. 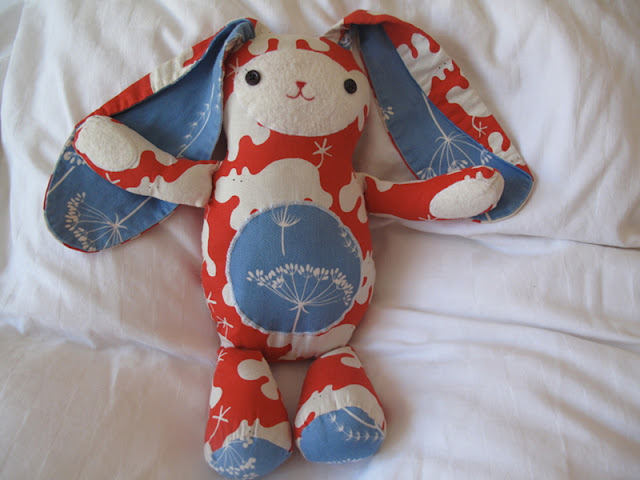 Spring naturally makes me think of Easter and that leads me my Jack Rabbit Softie Pattern! 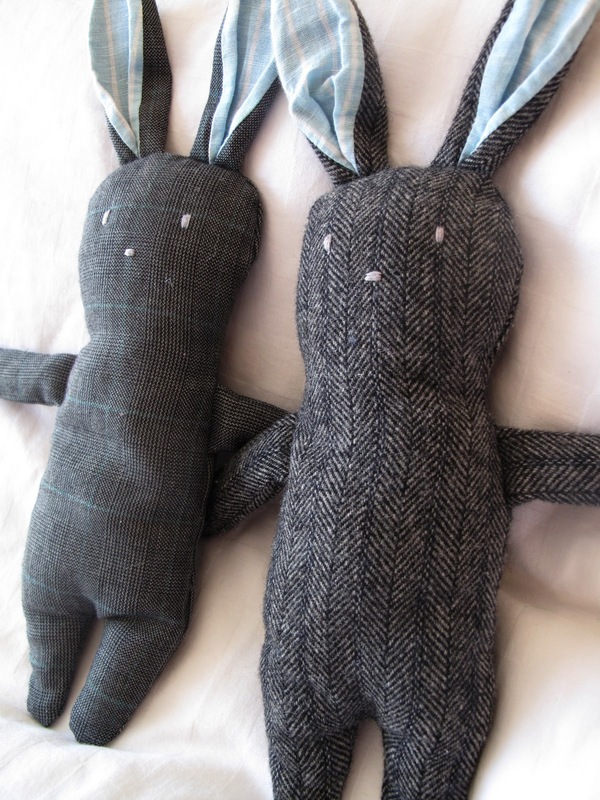 One of the very first things I made for my son after I really started sewing, was a set of two rabbits for his first Easter. Like I said, this was one of my first real projects, and my husband and I made it as a team. Before Mr. Carlee decided he wanted to get a PhD in Political Science, he was an Industrial Design student. He took lots of design and general art classes, and learned how to use programs like Illustrator and Photoshop. I love that he is creative, and we like to make projects together. Our usual arrangement is that he will draw something, and I'll bring it to life. For the bunnies, my husband helped me draw the body, and I made the rest of the pattern pieces. I also did all the sewing. We have made a few projects with this arrangement, and it's really fun to work on something together as a husband and wife team. I'm excited to share the Christmas stockings we made for our boys, but I think I'll wait until it's closer to December if that's okay with all of you. April is a little too early for me to start thinking about Christmas sewing. 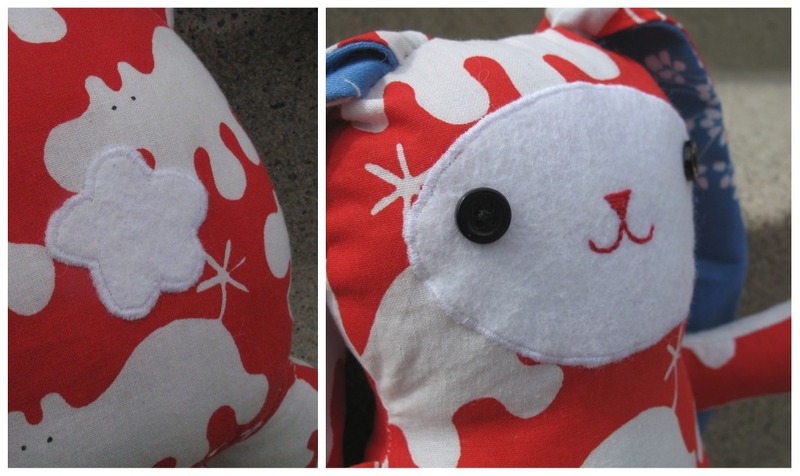 We made two stuffed rabbits, but since we changed the pattern to make the neck shorter after sewing the first one, they aren't a perfect set. My son has had these bunnies for 3 years now, and we have moved across the country since then, and somewhere along the way one has gone missing. Luckily the missing bunny was version A and not the revised and final version! 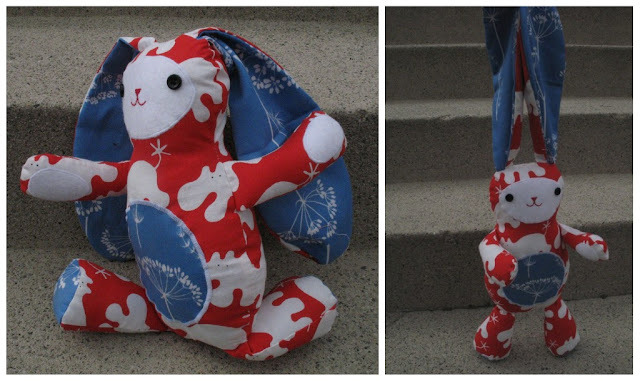 The Jack Rabbit Softie, stands about 15" tall, and measures 24" from ear to toe. He's a great size to cuddle, and easy to love with his big floppy ears. Do you want to make one too? These cute and cuddly bunnies would make a great Easter present, or a lovely gift for a new baby or small child. Maybe your husband would even like one? Lucky for you, I have done a lot of the hard work already, and the pattern and step-by-step instructions are free! All you have to do is round up some fabric, and start sewing. Come on over to The Polka-Dot Umbrella for a free copy of the pattern and detailed instructions! If you are wondering how your own Jack Rabbit Softie will hold up, here he is after sleeping with my son for the last three year. He's been washed, dried, and loved, and he still looks great! Super Cute!!!! I can't wait to get a pattern! It looks a little like American Bunny. Very cute. I'd love to make one - might also be nice for the 4th of July. Looks a little like American Bunny. Very cute. I'd love to make one. Might also be nice for the 4th of July.